Elbows do a tremendous amount of work every day, and there are a variety of tendons and muscles that keep the joint moving smoothly. Unfortunately, overuse injuries can cause pain and inflammation throughout the area, making it difficult to participate in daily activities. One of the most common conditions causing elbow pain is known as “tennis elbow”. 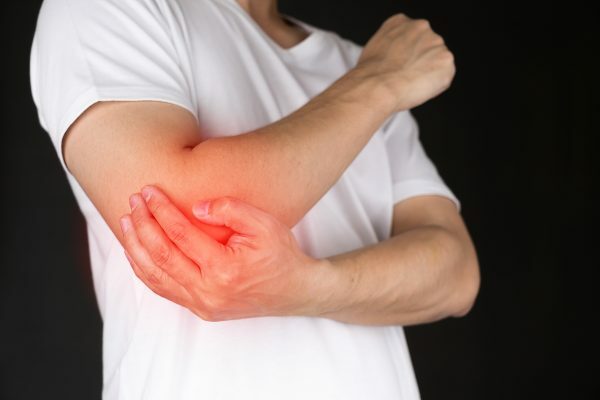 This develops when the joint is overworked during sports like tennis, which require massive effort from the arm muscles, elbows, and shoulders. Other activities that have been linked to tennis elbow include hammering, playing musical instruments, painting, gardening, and typing. Some individuals experiencing tennis elbow are able to treat their pain successfully using basic home remedies. However, when the pain is severe or doesn’t respond to home treatments, a variety of advanced medical treatments are available from your pain doctor in New York or pain doctor in New Jersey. In medical terms, tennis elbow is called lateral epicondylitis. This specifically refers to inflammation of the tendons that attach the bony prominence on the outside of your elbow to the muscles of your arm. As you participate in the activities mentioned above, you move the muscles in your forearm and your elbow joint in the same way over and over again. The repetitive motion causes micro-tears and inflammation in your tendons. For most people, tennis elbow starts with aching or discomfort when using the joint. If left untreated, it develops into more serious pain. Eventually, you may notice that your grip is weaker, which can be particularly alarming. Your pain doctor begins the diagnostic process by gaining a clear understanding of your medical history. He or she will ask questions to collect information, as well as review your medical records. Next, you can expect a thorough physical exam and some testing. Examples of common tests used to diagnose the cause of elbow pain include X-rays, EMGs, and MRIs. Together, these offer a complete picture of your bones, soft tissues, and nerves. All of this information is used to diagnose the underlying cause of your discomfort and determine the best treatment for elbow pain – NJ. Is There Home Treatment for Elbow Pain – NJ? The primary goal is to give your elbow a break from the stress that resulted in your elbow pain, so that your tendons have time to heal. Avoiding activities you enjoy can be an inconvenience, but it is the most important thing you can do to speed your recovery. What Should I Do When Home Treatment for Elbow Pain – NJ Don’t Work? Surgical treatments are a last resort when less invasive treatment methods fail. If surgery becomes necessary, it is typically followed by physical therapy. The experts at Pain Treatment Specialists are Board Certified, and they have extensive experience in effective treatment for elbow pain – NJ. Schedule your initial consultation online, or call the office today to schedule your appointment.